One of the most memorable action franchises returns in Die Hard 4.0 that once again reunites Bruce Willis as police officer John McClane. McClane is once again thrown into a deadly world of cat and mouse when in actually fact he was hoping to enjoy Independence Day weekend. With computer hackers around the United States being murdered, McClane is given the task of transporting one of these hackers to the FBI when he is caught in the web of a nefarious programmer for the FBI who is attempting to thwart millions and millions of dollars by destroying the United States infrastructure. With amazing stunts, action from start to finish and a really engaging storyline, Die Hard 4.0 is probably the second best Die Hard movie that has been revisited and moulded into something extremely memorable. Brilliant acting by Willis and co and even a really bad cameo by Kevin Smith (aka Silent Bob), this movie is definitely one for action fans and would make the perfect Christmas present. 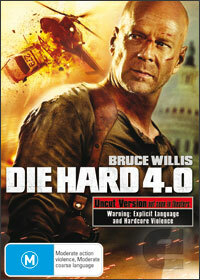 Featuring some great special features, perfect picture quality and audio, Die Hard 4.0 is a must have DVD. Yippee Kya! * Uncut Version not seen in theatres!